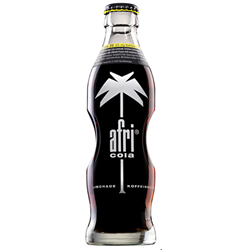 afri cola has been enthusiastically received not only by many of the die hard fans who have had to wait over 15 years for its return, but also by a new generation of selective beverage drinkers who appreciate its unique and beautiful bottle design, use of real sugar and natural ingredients, and also the extra energy that comes from the original high caffeine formula. The afri cola brand has gained acceptance across a wide variety of retailers. Current retail availability includes upscale grocers such as Nugget Markets, Harmons, and Raleys; beverage chains such as BevMo! and Total Wine and More (west coast locations); specialty retailers such as Rocket Fizz and Jungle Jim’s; convenience retailers including franchise 7-11, Circle K, and Chevron Extra Mile locations; and many other independent markets, deli’s, and on-premise accounts. Classic Beverage Imports, based in Napa California, is the exclusive US Importer of afri cola. Classic Beverage Imports focuses on importing beverages that are of premium quality (real sugar, natural flavors, quality ingredients) and are unique in terms of packaging, product type/flavor, or occasion usage. Classic Beverage Imports sources products that have no or limited distribution within the USA, but have solid potential and will drive curiosity and excitement amongst new consumers.